Almost reach the end and fuckkk you Odious Trident! Also, take that Titanic Lance! 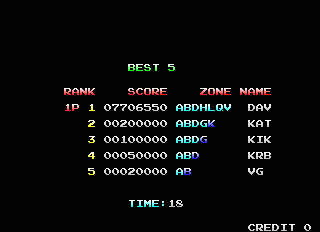 Ahh much better score, I also recorded the run but dunno if I would upload it on Youtube. One death, so I'm hoping to tidy this run up. Nice one, davyK! It's a really satisfying clear, isn't it? Yeah - very satisfying. 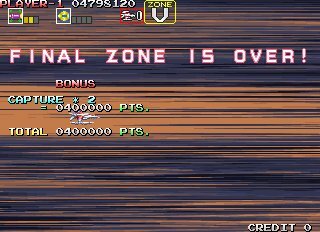 Rare for me to persevere with a game until I get a 1CC - but this game felt managable once I found the 1ups and figured out a path. I'm pretty sure I can make a no death run. The captain captures I have trouble with are D and Q. I need to be braver for those. If I get a run I'm happy with I'll start looking at other paths. I like how you dealt with Neon Light Illusion in your run. The rapid fire really opened this game up for me - but after watching your run I'd be interested in trying for a 1CC with no rapid fire even though I'm past trying to hammer buttons a lot I'd need to change the setup so I have 2 fire buttons beside one another to get the rapid fire I'd need for some enemies. Some of the bosses will last a bit longer but I'm guessing once you get powered up to the wave weapon you might not need quite as much rapid fire.. I noticed you accidentally powered up your wave weapon from the optimal level and so bosses from then on would have lasted a bit longer too. I've an INP of my run - will post a video of it so you can see much easier some sections are with the rapid fire. Cool! Yeah, I cleared the Extra Version recently as a reminder of some of the differences related to full-auto. Playing without rapid fire definitely requires a different approach to most sections, but you can actually get through most of the game without hammering the buttons at all. MathU does this in all of his videos, only tapping in a few key spots. The stages are still very manageable, for the most part, since you still cut through most enemies effectively, but it means you're more likely to see each boss's full range of attacks, and the ones some of them pull out when they're almost dead are terrifying. The zone Q Captain was a total fluke in that run, to be honest - I haven't figured out how to capture it consistently yet but it moved the right way for me! I normally just focus on not getting trapped against the ceiling or floor by it. Zone D's is a bit easier to manage, though, since you can lead it wherever is most comfortable for you during its 'tracking' phases, get above it when it stops to bomb the orb, then pull back before it moves up toward you and starts tracking again. If you're on the right side of the screen, behind its head, the fireballs can't reach you. Yup - 1 death. It was at the start of Zone V when those 2 orange top shaped ships appear. I usually deal with those OK.
DG Extra is fun. Have only tried it a few times. 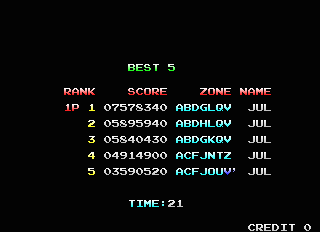 But I'll stick with plain DG - when I get a deathless run I'll go got the non-rapid run. Then I'll think about extra. 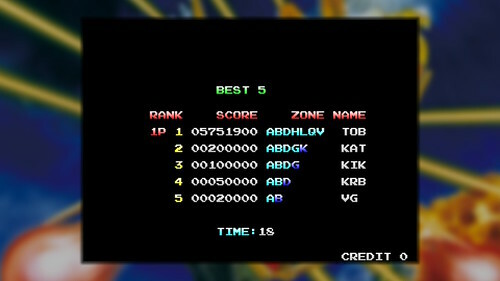 What's funny about auto rapid is that it is shown being used in the demo mode of the Saturn version. Not sure why that is the case. Last edited by davyK on Sat Apr 06, 2019 11:48 pm, edited 2 times in total. Haha, yeah, that was how I first found out about it! Kind of reminds me of all of the extra abilities in Super Metroid's attract mode you're never officially taught about. Those zone V enemies have ended a few no-death runs for me too. They move in a simple pattern that's easy to read but I still sometimes get hit by the parts that fly away after you blow them up. Recorded run ghetto style...need to get myself a new PC and frame grabber to get better videos. Nice work! I reckon your no-death run is in the bag. Beat my score! I tried the PS2 Taito Legends version of DG. Not that impressed with it. I'm in the PAL region but Taito Legends lets you select PAL or NTSC on boot up. 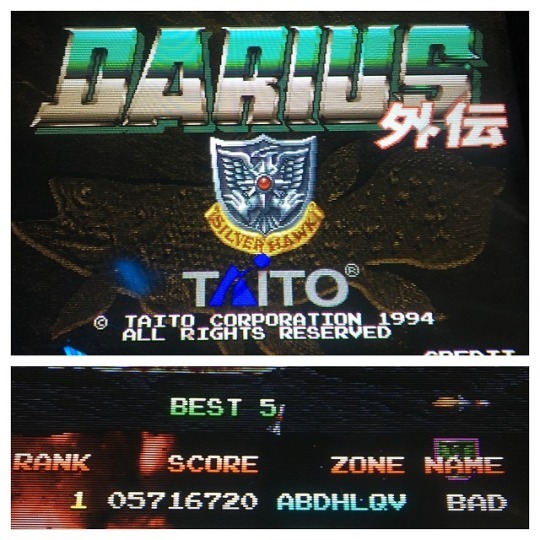 Darius Gaiden doesn't seem to be affected by that setting - it felt slow (I'm playing the JP-NTSC version on my JP Saturn). No rapid fire either. I got about half way through and my arm was aching!!! !